The referendum result will have far reaching repercussions for the UK and indeed the global economy and property markets, argues James Roberts. One of the first outcomes from the result of the referendum is that the value of the pound will inevitably fall in the near-term, as will the stock market. The chances of a technical recession, as business investment is curtailed, is high, and exporters and financial services firms will be in the forefront of the downturn. In the light of the above risks we expect the Bank of England, seasoned by the experience of Global Financial Crisis, to respond quickly. An interest rate cut of 25 basis points is a strong possibility at the Monetary Policy Committee’s July meeting, or perhaps earlier if required. We may also see a return of quantitative easing, if there are signs that investment is deteriorating. This should in our opinion help restore confidence as the summer progresses. Unemployment is a lagging indicator, so any job losses will take time to filter through to the statistics. Similarly, any inflation driven by the pound’s devaluation, will probably come through later. Consequently, we see the effect on the UK as consisting of a high speed minieconomic cycle. In the coming weeks, a combination of falling sentiment and those investors who are over extended having to sell will result in some disposals which will be likely to weigh on asset prices. This we see coinciding with a devaluation of the pound. The combination of lower prices, plus exchange rate effect should then draw in overseas investors looking to acquire assets in the UK, attracted by a G7 country with a track record of achieving strong economic growth. The re-emergence of inflation, resulting from the devaluation, will in our opinion push investors towards growth assets later this year or early next. Also, in the coming months, more indication will emerge on the future direction of the UK economy. Consequently, we believe asset prices for the more robust sectors could be back to roughly where they were pre-referendum by summer 2017. Ultimately, it should be remembered that the UK is a country with 60 million wealthy consumers, and a high skill workforce. Consumer goods firms like Coca Cola and BMW will always want to access a market this big. Skills based employers like PwC and Google will always want to access such a large pool of talented workers. The underlying strengths of the UK economy remain in place, and ultimately real estate is an investment that works best for those who pursue long-term goals. The result of the EU referendum will impact on property sectors across the UK in different ways. The UK vote in favour of Brexit has the potential to make a relatively swift impact on the housing market. The scale of this effect, especially in the medium to long-term, will depend on the outcome of negotiations on the UK’s exit. In the short-term, consumer confidence is likely to be knocked by the continued uncertainty, especially with regards to trade. This may weigh on activity in the market, especially those making discretionary purchases, which could result in a slip in transaction volumes, and prices. However, uncertainty could also result in a further dampening of homes coming onto the market, and this lack of supply will provide a floor under prices. There is also a chance that mortgage rates become detached from the base rate. While the base rate may well be cut in the coming weeks, lenders may raise their rates as a technique to control their lending levels. Both the reduced availability and increased cost of credit could put additional pressure on transactions as well as affordability. However, it is worth noting that much mortgage activity recently has been in fixedterm fixed-rate deals, ranging from 2 to 10 years. Borrowers on such deals will not be affected by rising mortgage rates over these time frames. In the longer term, any increase in inflation could trigger base rate rises, which would again translate into higher mortgage rates. This scenario would be more challenging for those on variable rate deals. If house prices are also declining, this will put the most pressure on highly leveraged borrowers. The second-round effects from a slowing economy and growing unemployment will also be felt in the housing market, as these factors affect household incomes as well as sentiment. In the short to medium-term, the fundamental demand and supply dynamics in the market are unlikely to change, with a continued structural undersupply of homes across the country, underpinning pricing in some of the most desirable and best connected areas. 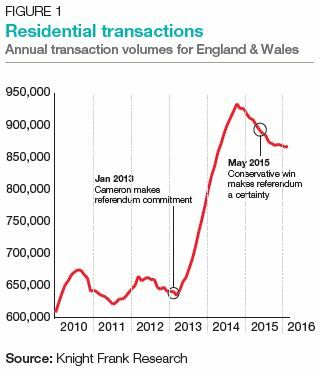 Sales activity and price growth in the prime London residential market have both slowed since mid-2014. The EU referendum has been only one of a number of headwinds which have impacted the market. The UK election, the threat of a Mansion Tax, the imposition of higher rates of stamp duty as well as the additional rate for investors and second home buyers, have all conspired with the EU vote to dampen market sentiment. The very strong volume of sales seen at the end of Q1, bolstered by the impending additional rate of stamp duty, was bound to weigh on deal levels in Q2, but it is fair to speculate that at least part of the decline since April has related to market uncertainty caused by the referendum. There is no doubt that the vote in favour of Brexit will generate a period of renewed uncertainty in the prime London residential market. Some demand, especially from investors, will be delayed and in some cases redirected to other markets – although the significance of these trends should not be overstated. Demand for prime London property rests on a wide range of drivers – most of which are unaffected by the referendum decision: the scale of London’s business cluster, depth of skills, education, lifestyle and language. It is not easy to identify an obvious alternative destination for investors despite short-term nervousness. On the eve of the vote the pound sat 14% below its mid-2014 peak meaning pricing in the prime market was more attractive for dollar buyers. While a further weakening of the pound could increase inward investment, this impact will be constrained by the fact that around 80% of central London buyers are UK residents. It seems a reasonable assumption to make that interest rates will be lower for longer, despite the risk of imported inflation from a weaker pound. While the long-term benefit of ultra-low interest rates on the housing market may be questionable, in the shortterm they will act to underpin demand especially for equity rich buyers with access to the best funding rates. The prime country house market will be similarly impacted by the result. However while the market has performed relatively well over recent years, following a slow recovery immediately after the financial crisis, prices have not tracked London to date and there is scope for some outperformance in the short to medium term. While we are entering a period of renewed uncertainty in the UK and London market, ongoing issues around EU and especially Eurozone stability, which will be highlighted in the run up to French and German elections, are likely to counter this risk and shore-up London’s safehaven appeal. British buyers, although an important component of demand across Europe’s key second home markets, are less dominant than they were pre-2008. Demand has been supplemented instead by a diverse mix of northern Europeans, non-EU purchasers (from the Middle East, US and Asia) and domestic buyers. This greater cross-section of demand has meant many second home markets are now supported by a broader cohort of buyer nationalities. The leave vote will have a greater impact on sales volumes than prices, particularly given that the gap between demand and supply has narrowed in the last 2 to 3 years and market fundamentals are on a firmer footing. The impact of uncertainty on buyer sentiment will, to some extent, depend on the speed of negotiations on a future trade deal between the UK and the EU. With 1.2m UK citizens living in EU member states, including 250,000 in Ireland, both the EU and national governments will be keen to expedite negotiations, conscious of the need to retain the labour and capital their UK populations contribute. Despite the uncertainty there will be buyers keen to press ahead with their purchase and unwilling to put their plans on hold either for personal or financial reasons, just as we saw in the run up to the referendum. Even if the UK economy slips into recession in the event of a leave vote, retail sales will not necessarily follow suit. As the last recession proved, retail sales patterns do not religiously track GDP performance. Consumers may tighten purse strings and realign spending priorities, but they will not stop spending altogether. Retail sales performance will remain erratic. The prospect of rising inflation may ordinarily be regarded a threat to consumer markets. For the retail market as it currently stands, it may turn out to be a blessing. There has been too large a gap between retail sales volumes and sales values. Inflation will help narrow this gap, as long as retailers take the bold step of passing on raw price increases to consumers. A leave vote may have a surprisingly neutral effect on occupier markets. Although some retail occupiers have tied their colours to the remain or leave masts, the outcome is unlikely to destabilise occupier markets either way. Retail property investment markets will be most affected by a “leave” vote, albeit to no more or lesser degree than other commercial property sectors. The retail sector may well benefit from ‘bargain hunting’ investors from overseas, taking advantage of any fall in the value of sterling. The post-financial crisis world has shown all too clearly that big business abhors uncertainty. In one sense the result of the EU referendum has brought clarity – a future away from Europe. Yet uncertainty for business firmly remains. It is therefore inevitable that business behaviour will be stifled over the short-term and that the recent delays in occupier decision making will persist. Despite this, over the medium-term there are reasons to be positive. First, the pessimistic scenarios highlighted during politicised campaigns often fail to emerge. Many business commentators pointed to Britain losing out if we failed to join the Euro, but history has shown that this did not deter inward investment. Second, recent history has proven business to be highly skilled at adapting to changeable operating environments. Third, as the dust settles, and the economy stabilises, businesses will reconnect with the fundamental qualities of the UK as a business location; ranging from corporate tax rates, to the large consumer market, to the GMT timezone. It is inevitable that business operations will be restructured on the back of the leave vote. Yet it should be recognised that such restructuring is a feature of modern businesses as they respond to disruption and a low growth economic environment. The decision by UK voters to leave the European Union will cause volatility across all investment markets, and real estate will be no exception. Uncertainty over future economic conditions in the UK will cause some deals on hold to be shelved, and occupiers will reconsider the amount of space they need outside of the single market. A fall in the value of sterling, combined with falling property values will be a buy sign for opportunistic overseas investors once the initial correction has occurred. This will cause a widening yield gap as real estate yields rise and bond rates fall from further Bank of England monetary loosening and will make property a favoured asset class in an unpopular investment destination. 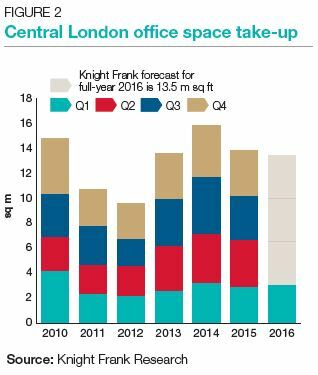 The vote to leave the European Union creates both threats and opportunities for the Central London office market. Economic uncertainty is rarely a positive for any market, and in the short-term we should expect some occupiers to delay committing to new office moves as they take stock of what the new landscape means for their businesses. London represents the largest market for euro-denominated trading, and major banks with euro trading desks in London may find that they need to relocate some of these functions to office markets within the EU. While this does not necessarily mean a wholesale relocation, we should expect some vacant space from banks to come to the market once this restructuring has taken place. However, it should be noted that many businesses with a large London presence are focused on markets outside the EU, and the UK’s exit from the Union will have a limited impact on them. The referendum, and possibility of Brexit, has been a live risk since the Conservative victory in the general election in May 2015. Since the general election, there has been above-average office take-up suggesting firms have adopted a business-as-usual approach; global operators such as Deutsche Bank, Thomson Reuters, Ashurst, Google and Facebook have made significant long-term commitments to London. There is likely to be some release of office space as businesses tighten their belts to weather the period during which trade treaties are being negotiated. However, currently availability levels are particularly low and the development pipeline remains fairly limited. The market has capacity to absorb a rise in supply before there is a possibility of a fall in prime headline rents. The impact on the investment market is likely to be less obvious. While the economic uncertainty during our exit negotiations will undoubtedly deter some domestic investors, the relative discount available to purchasers in foreign currencies will attract significant interest. In the medium-term however, Central London commercial property will continue to offer a higher yield than most other asset classes, and may even benefit from the instability in the equity markets. The UK hotels property market has already felt the effect of the referendum with a slowing in investment volumes since the start of this year. A secondary impact, with the subsequent fallout from the vote to leave the EU, will follow. The London hotel market will bear the brunt of the Brexit impact, as the political and economic turmoil will be likely to result in weakening hotel trading performance in the short-term. However, a number of positive influences will prevail in the medium to long-term. A fall in the value of Sterling will make UK property more attractive to foreign investors in hotels. Meanwhile, a weaker currency will attract greater demand for hotel accommodation from overseas visitors.